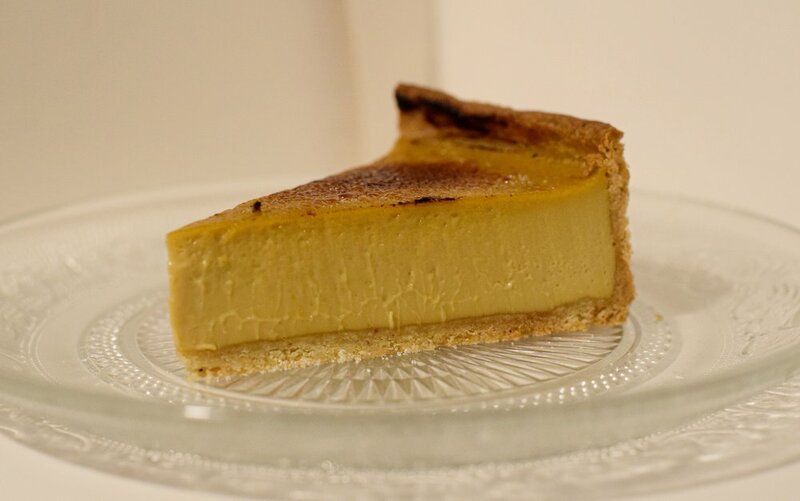 When I first made this tart, I cut a small slither from the first slice and handed it to my Dad, who was sat, like most Fathers on a Friday evening, in recuperation position number one, slouched in a chair in front of the television. Whether it was my approaching shadow in his peripheral vision, or the enticing aroma of the buttery brown sugar delight I placed beside him I don’t know, but he registered a change in his surroundings; a tasty one. He delved into the tart, TV forgotten, and stated quite simply: ‘My gosh, that’s seriously rich’. Job done. As such, this tart comes with a disclaimer - it is unapologetically decadent, and enthrallingly addictive. The crisp and buttery mahleb-spiced sweet pastry melts in the mouth, giving way to the encased rich, muscovado custard in all its caramel glory. 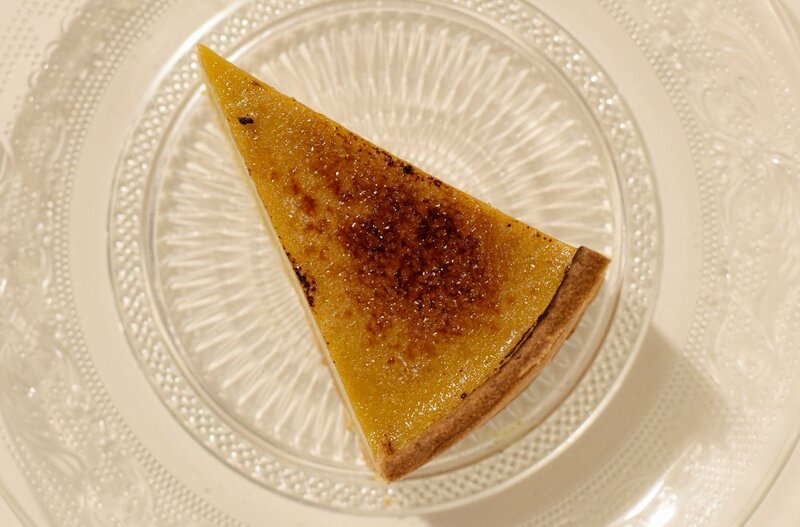 What’s more, the satisfying snap of the brûlée top adds a warming depth to the tart, with notes of treacle and caramac. In terms of ingredients, the tart couldn't be simpler, the filling comprising of just cream, egg yolks and muscovado sugar. However, because of this, it is of the upmost importance that these ingredients are of the best quality. For the sugar, only dark brown muscovado will provide an adequate level of molasses, the lighter varieties tending to yield a tart that is too sweet and lacking complexity. I would also urge you to opt for high quality free range eggs; I use Burford Browns for their striking, sunset orange yolks and rich taste. The cream, where possible, is best locally sourced. For the brûlée, I like to use golden granulated sugar; the higher level of molasses yields a deep, toffee flavour, whilst the larger granules help achieve a crisper top to enjoy breaking through. I have included the recipe in its simplest form below, although there is much room for creativity with this tart. For example, the cream can be easily infused by bringing it to boiling point, adding your chosen flavour such as orange zest, a cinnamon stick, or cardamom, and allowing a little time; this could be up to 24 hours if left covered in the fridge. When ready to make the tart, simply remove your chosen infusion by sieving the mixture into a clean saucepan, and proceed with the recipe. The recipe is very straightforward, but do take care to remove the tart from the oven whilst it still has a slight wobble in the centre. The tart will continue baking as it cools down, and will set to be smooth, light and oh so comforting. Combine the flour, ground almonds, golden icing sugar, salt and mahleb in a large bowl. Whisk together to combine. Add the cubed, cold butter and rub in with your fingertips until a fine breadcrumb consistency is achieved. Add the egg yolk, vanilla and water and bring together to form a smooth dough. Flatten into a round disc, wrap in cling film and refrigerate for at least 2 hours, preferably overnight before use. When ready to use, remove the pastry from the fridge; allow to stand for 20 minutes to soften slightly. Lightly dust a worktop with flour and roll the pastry to approximately 2mm thin. Use the pastry to line a 20cm tart ring, at least 4cm deep. Trim away any excess pastry from the top of the ring, and return to the fridge to chill for at least one hour. Preheat the oven to 180c, and when at temperature, remove the tart case from the fridge. Line with a quadruple layer of bake safe clingfilm and fill to the top with baking beans or rice. Bake for 18 minutes, then take from the oven and remove the clingfilm and baking beans. Reduce the oven temperature to 160c, then return and bake for a further 12 minutes. Remove from the oven, egg wash the tart case and return to the oven for a final 3 minutes to set before removing and allowing to cool. In a bowl, combine the egg yolks and sugar and whisk to combine. Set aside. In a large saucepan, combine the creams and heat to boiling point over the hob. (At this point you could add an infusion and let stand, then resume the recipe from step 1) When just boiling, pour over the sugar and yolks and whisk smooth. Sieve the mixture into the baked tart case, then carefully place in the oven and bake for 30 minutes, until still quivering in the centre. The tart should be quite full, so go slow! For the brûlée, first slice the tart into portions. Scatter sufficient golden granulated sugar to cover the top of each piece, and carefully use a blow torch to caramelise. Enjoy the tart straight away to ensure the top is optimally crunchy!